Trade marking is internationally recognized to safely protect and guard against fraudulent imitations. Nebula Stone is an igneous stone and Kambaba is a fossilized alga. They are geologically and mineralogically completly different materials. Kambaba Jasper has been sold under many, many different misleading names to mislead the unsuspecting public. (Kambamba/Eldarit/Kambaba/Kabamba/Kabamby/Cumbamba/Cambamba/Kumbara Jasper/ Brecciated Army Jasper/Camo Stone Kambaba Jasper/Combamba/Amphibianite/Fossilized Stromatolite Algae/ Green Stromatolite Alga/ Crocodile Jasper/ Crocodile rock Etc. Kambaba/Kumbara Jasper/ Crocodile rock are Stromatolite Fossils of fossilized Algae. They are sedimentary fossils. Stromatolites fossils (Kambaba Jasper/Kumbara Jasper and Crocodile rock) are massively mined by Corporate mining companies around the world. It's known that some unscrupulous sellers make up new names for well known stones and crystals in order to sell them to an unsuspecting public. And now there are companies that are trying to capitalize on the popularity of our stone's name (Nebula Stone™) because they have learned it has become very popular around the World. Those who either have wrong information or are being unscrupulous have been falsely selling Kambaba Jasper falsely pretending it was Nebula Stone. Some unethical companies have intentionally sold Kambaba/Kambamba/Kumbara Jasper/Kabamba Jasper/Crocodile Jasper from Madagascar and South Africa falsely calling them Nebula Stone and other variations of the name. There are wholesalers that are deceiving the retailers, public, metaphysical and mineralogical communities by falsely calling "Kambaba Jasper" ... Nebula Stone, Eldarit, Nebulastone, Nebular Stone, Nebula Steine, Nebula Jasper, Eldarit Nebulastone Kambaba. So we felt some pictures and documentation showing the differences between Nebula Stone and Kambaba was needed to eliminate the confusion. Kambaba Jasper is not Nebula Stone. They are geologically and mineralogically entirely different. Nebula Stone is an igneous stone. Kambaba Jasper is a sedimentary fossil, a stromatolite algae, in essence a fossilized algae. Nebula Stone is geologically created from minerals from within the earth whereas Kambaba jasper is created from giant colonies of algae and sand in the ancient ocean that have fossilized over time. * Kambaba Jasper (fossilized Stromatolite Alga) is the stone they call "Crocodile Jasper" from Madagascar that others have bought and sold giving it the name Kambaba Jasper and all the other copy-cat names. Crocodile Rock (Kambaba Jasper or Fossilized Stromatolite Algae) is sold as crocodile rock in Madagascar and then it is bought and falsely renamed Kambaba Jasper and other names by unscrupulous companies in other countries including the U.S., Brazil, France, (especially) Germany, Belgium, Netherlands, India and Africa. Norcross-Madagascar Minerals Tucson show 2008 web page: "Tucson '08 Show Info"
"Crocodile Jasper Spheres (formerly Kambaba Jasper or fossilized stromatolite algae)." Norcross-Madagascar in their "Tucson '09 Show Info" email that they email around the world and to Tucson show buyers. Norcross-Madagascar is the largest stone mining and cutting and exporting company in Madagascar. Norcross-Madagascar Minerals says Kambaba Jasper is a "fossilized Stromatolite Algae" then that is what Kambaba Jasper is, a fossilized Stromatolite Algae. Norcross-Madagascar Minerals are the miners of "Crocodile Rock" (Kambaba/Kumbara Jasper) the Stromatolite Algae fossil and the foremost experts on that subject. The example below is just one of the many, many confusing different names of what one can find on the web. 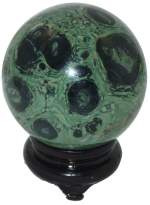 This hand-polished Cambamba Jasper sphere mineral specimen is from Madagascar. Cambamba Jasper (also called "Kambamba" or "Combamba" Jasper in the U.S.) and was almost called amphibianite because of its amphibian-like appearance. Which is grayish green with black stromatolite spots. The example below is from a GIS (geographic information specialist) Geologist in Belgium. "Jasper Kambamba (or Kambaba or Eldarit or Amphibianite ...)"
This is a variety of fossil (so 'defined) from Madagascar but I do not know anything, or rather, I have not found anything scientifically interesting and I do not know where to find information subject (if you have data, theory, publications please comunicarmele please). Dating from about 3 billion years (? I am not sure), is characterized by structures that actually orbicolari are associated with algal structures. Sample size 11cm x 11cm. The two images below (copying image was not allowed) show a typical structure raggiata that develops from a core. The buildings algal (type gyrvanella and oncoidi) normally possess a concentric and radial not, unless it is a particular type of oolite, whose size pero ', in this sample, around 5-10mm. So as you see, they have named the fossilized algae many different names. When we discovered Nebula Stone in 1994 we sent samples to Dr. Leslie Hale with the Smithsonian Institution, Dr. George with The American Museum of Natural History, Dr. Sid Williams of Globo De Plomo, Dr. Dave Douglas researcher UCLA, Dr. Vergil Leuth with New Mexico School of Mines and others. Nebula Stone was analyzed using X-ray Dispersion Analysis (EDX) in a Scanning Electron Microscope (Microprobe/SEM), Polished Section Analysis, XES Elemental Analysis, XES Search (@1/4), Digital Imaging, Photomicrographs, Back-Scattered Electron Detector (BSE), Petrographic Analysis and X-ray Diffraction and the Electron Microprobe. The Nebula Stone description below is from the mineralogical Petrologist Dr. Sid Williams. The technical description of the Nebula Stone may not be much fun to read but at least it would be familiar to a professional geologist if it were in your interest to use it in that manner. In plain English stripped of jargon it means that this stone is a fresh and unusual alkalic volcanic rock composed of the minerals Quartz, Anorthoclase, Riebeckite and Aegirine. Quartz and Anorthoclase form the groundmass of the gem, while Riebeckite and Aegirine are an integral part of the spherulites. The darker matrix is richer in Riebeckite and also contains more Quartz and Anorthoclase. The light green spherules you see in the stone composed of radiating fibers are riebeckite needles mantled with fine grained Aegirine. This stone evolved from inside the Earth with it's discrete rare combination of minerals cooling and crystallizing forming as a glassy unit that devitrified slowly under quiescent conditions. Spherulitic structures began to develop in the glass by virtue of devitrification while other portions of the glass residium remained slightly mobile, showing streaky structure around those domains in an advanced state of crystallization. Ultimately the glass base also devitrified under static conditions. This has produced a matrix of Quartz and Anorthoclase which occur in complex intergrowth. typically the Anorthoclase is present as slender lath-like crystals or feathery club-shaped prisms (points) floating in an interstitial filigree of Quartz. Within spherulites Anorthoclase is predominant and there is less Quartz for it appears to have segregated from these domains during crystallization. Lying side by side with the anorthoclase laths are slender prisms (points) of Riebeckite which may attain considerable length and yet never exceed 10 or 12u in width. The matrix of the stone contains considerably more clear Quartz-rich vein-forms and in places it has grown nearly at the exclusion of Anorthoclase. However, needles of Riebeckite still lie within these minerals and their common orientation is suggestive of flow banding around spherulites. Granular Aegirine occurs in the matrix where it appears to have replaced or supplanted Riebeckite almost entirely and the largest grains occur in late magmatic vein-forms carrying clear granular Quartz. 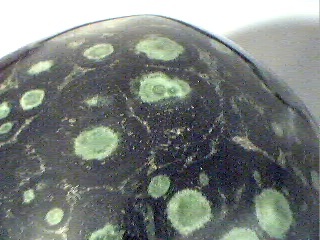 Aegirine occurs within spherulites and it lies side by side with Riebeckite needles and appears to replace their margins. What this means is that the minerals were once molten and glass-like but cooled very slowly, allowing the discrete minerals to begin to separate out and crystallize so the final product had lost its glass-like condition. This allowed the green (orbicules or spherulites) to form as the different component minerals cooled and crystallized at various rates. I have sent a small packet to you under separate cover. It contains the rock sample I borrowed from you, the thin section, and a couple of photomicrographs. Photo (01) shows a partial termination of a quartz crystal and perhaps this is a "point"; I cannot imagine any other definition of the term. Photo (02) - number not visible for some reason - shows a similar situation, although the crystals not so well defined. However, the specimen I borrowed shows numerous terminated quartz prisms in the matrix. We have learned that there is some confusion about what really is authentic genuine Nebula Stone. The pictures below will make it clear. Some companies have cut out the small black and green pieces of Kambaba and falsely sold them as small Nebula Stones or jewelry or rings. Kambaba Jasper or Crocodile rock are Stromatolite Fossils of fossilized Algae. Stromatolites are massively mined by many giant Corporate mining companies around the world. Kambamba/Kambaba/Stromatolite, Fossilized Stromatolite Algae/Kambaba/Eldarit/Kabamba/Kumara/Green Stromatolite Jasper, Kabamby/Cumbamba/Cambamba/Combamba/Combamby/Amphibianite/Stromatolite Jasper/Galaxyite, etc/Brecciated Army Jasper/Camo Stone Kambaba Jasper. Fossilized Stromatolite Algae comes in many variations and different countries. The Kambaba variations falsely being sold under it's many different copy cat names primarily comes from the South African Rift, near Madagascar. It has been resold under many, many different misleading names to mislead the public. And now some unethical companies are intentionally selling Kambaba Jasper falsely calling them Nebula Stone and other variations and combinations of the name. 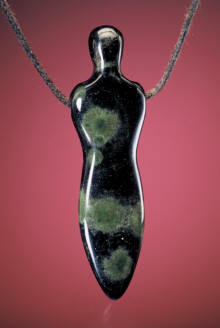 Kambaba and Nebula Stone contain different mineral compositions and color combinations. Nebula Stone is an igneous stone and Kambaba is a fossilized alga. They are geologically and mineralogically different materials. Nebula Stone is geologically created from minerals from within the earth, whereas Kambaba jasper is created from giant colonies of algae and sand in the ocean that have fossilized over time. Kambaba jasper (Stromatolite algae) is commonly formed by the trapping, binding, and cementation of sedimentary grains by microorganisms, especially blue-green algae. Precambrian stromatolite is the oldest of all fossils, The banding that commonly appears in stromatolite is a record of the growth patterns of colonies of microorganisms, principally photosynthetic cyanobacteria, but also other Eubacteria and the Archaeans. The colors that are often expressed are the result of the interaction of biological and sedimentary processes, together with subsequent chemistry and mineral exchange. Stromatolites are most often described as biogenically-produced structures formed by colonies of photosynthesizing cyanobacteria (blue green algae). One can easily see the difference in the pictures below. "Madagascar Minerals" fossilized stromatolite algae. The Kambaba sphere and the Kambaba heart and cabochon (shown above on the left) are fossilized algae. Kambaba jasper is usually NOT a dark background (Matrix). 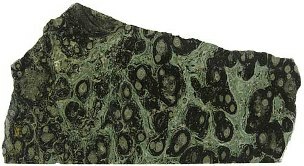 The base color of Kambaba is usually "bluish-gray-green with mottled fossilized stromatolite algae patterns of black spots with black swirls and sometimes green spots with less black, but the base (background color) of the kambaba fossil is usually lighter bluish-gray-green." Kambaba jasper is a sedimentary stone of fossilized algae (stromatolite - a mass of algae) from the ancient ocean that fossilized over time turning the algae into stromatolite Jasper (Kambaba/Crocodile rock). The colors that are often expressed are the result of the interaction of biological and sedimentary processes, together with subsequent chemistry and mineral exchange. Stromatolite Kambaba Jasper (sometimes sold as Kambaba Jasper) has green to black coloring, marked by fossilized ‘biomass’ structures. 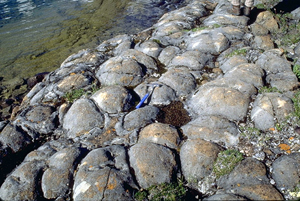 Stromatolites contain rudimentary algae fossils and are known to be among the plants that contributed to the production of oxygen in the early atmosphere of earth. Stromatolite Kambaba Jasper contains evidence of the planet’s biological activity over many thousands of years. 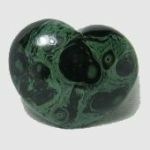 Stromatolite Kambaba Jasper is a stromatolite jasper of loden green with mottled patterns of black specks with black swirl and orb patterns. 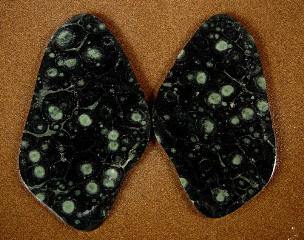 Kambaba Jasper Is a biological fossil of bioorganic origin (stromatolite). Nebula Stone is geologically created from minerals within the earth, whereas Kambaba Jasper biologically originated on top of the earth from cementation of sand and algae. Trade marking is internationally recognized to safley protect and guard against fraudulent imitations. (crystallized minerals from within the Earth). Nebula stone is a fresh and unusual alkalic volcanic rock composed of the minerals Quartz, Anorthoclase, Riebeckite, Aegirine, Arfedsonite and Zircon. Quartz and Anorthoclase form the groundmass of the gem, while Riebeckite and Aegirine are an integral part of the spherulites. The darker matrix is richer in Riebeckite and also contains more Quartz and Anorthoclase. The light green spherules you see in the stone composed of radiating fibers are riebeckite needles mantled with fine grained Aegirine." The eyes in Nebula Stone are crystallized minerals of Anorthoclase and Riebeckite points mantled with fine grained Aegirine crystals. The green Quartz, Anorthoclase and Riebeckite form the matrix of Nebula Stone. Nebula Stone is a deep green (almost black) Quartz matrix. The base color of Nebula Stone "is deep green appearing almost black with magmatic clear Quartz-rich vein-forms carrying clear granular Quartz throughout the matrix with microscopic prisms (points) in the self healed veins of Quartz." If you were sold a misnamed stone and then see by these pictures that the stone is really Kambaba...then by all means tell the store and help them by emailing them this page or the above links. Please email us a photo or give us a call if you have any questions about the stones you are about to purchase, or that you are offering. You may go to our web site if you want to learn more about our discovery of Nebula Stone and see more examples and pictures. Also please click on Eldarit is a Fabricated Fantasy word to understand that Eldarit is not a real stone's name it was a fabricated name falsely made up by a man in Germany to sell Kambaba jasper in Europe using other names. If you are interested in seeing more examples of Nebula Stone Our web site is www.nebulastone.com . Mineralogical analysis from Smithsonian Institution and other expert Minerologists. The Discoverers, The Origin and The Direct Source of all Genuine Nebula Stone™ Spheres, Nebula Stone Crystal Skulls, Jewelry, Carvings and Nebula Stone Tumble Stones, Nebula Palm Stones, or related Nebula type stones, etc..
☺ Please feel free to email this page or link to friends and anyone in the wholesale, retail, internet, Mineral, Jewelry, Collectors, Esoteric and Metaphysical communities, and Church members and group members around the World wide web to help them understand the difference and help spread the truth. You may post or link this information on your web site or EBay store to help your readers see and know the difference. "Just like the Nebulas, Just like Ourselves Everything is Reborn and Continues"
Yes, you may email this page to others.